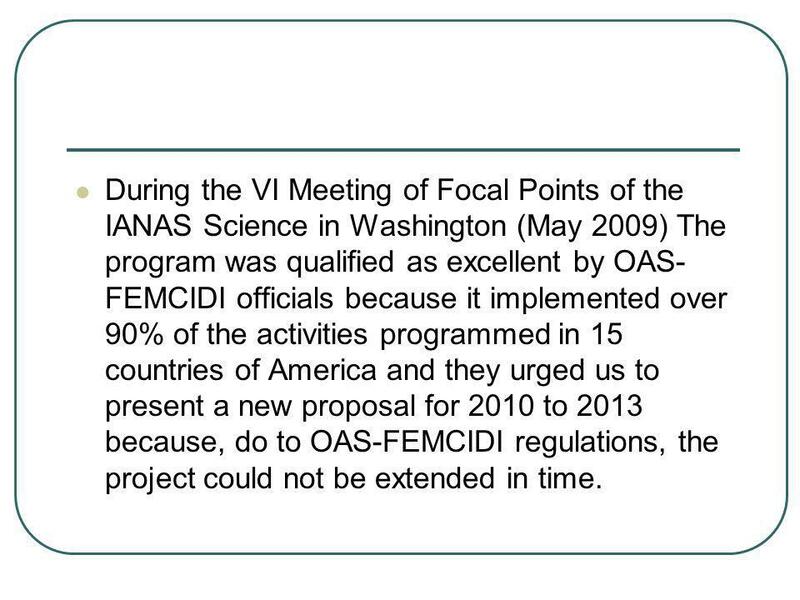 16 During the VI Meeting of Focal Points of the IANAS Science in Washington (May 2009) The program was qualified as excellent by OAS-FEMCIDI officials because it implemented over 90% of the activities programmed in 15 countries of America and they urged us to present a new proposal for 2010 to 2013 because, do to OAS-FEMCIDI regulations, the project could not be extended in time. 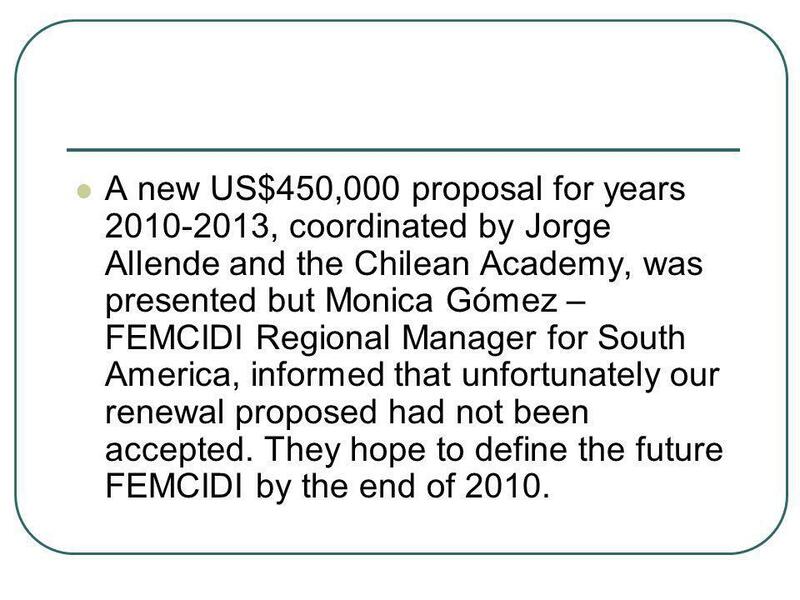 17 A new US$450,000 proposal for years , coordinated by Jorge Allende and the Chilean Academy, was presented but Monica Gómez – FEMCIDI Regional Manager for South America, informed that unfortunately our renewal proposed had not been accepted. 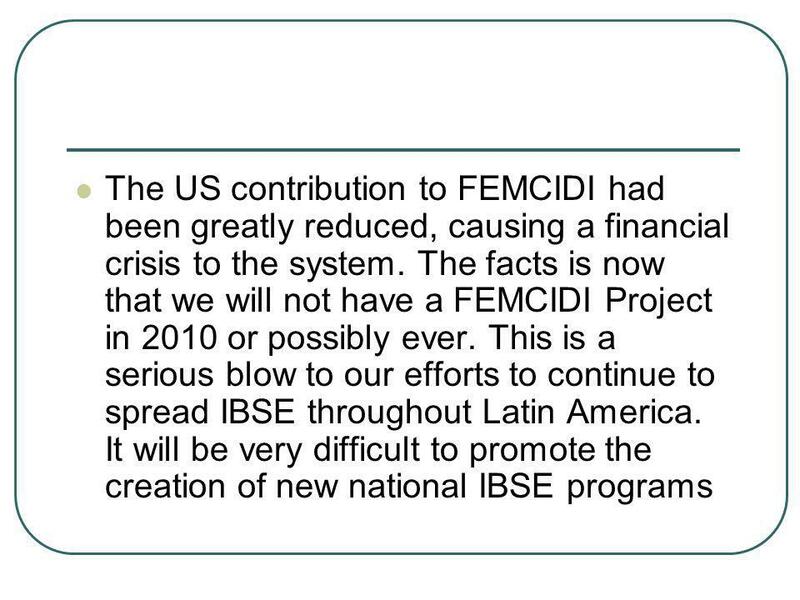 They hope to define the future FEMCIDI by the end of 2010. 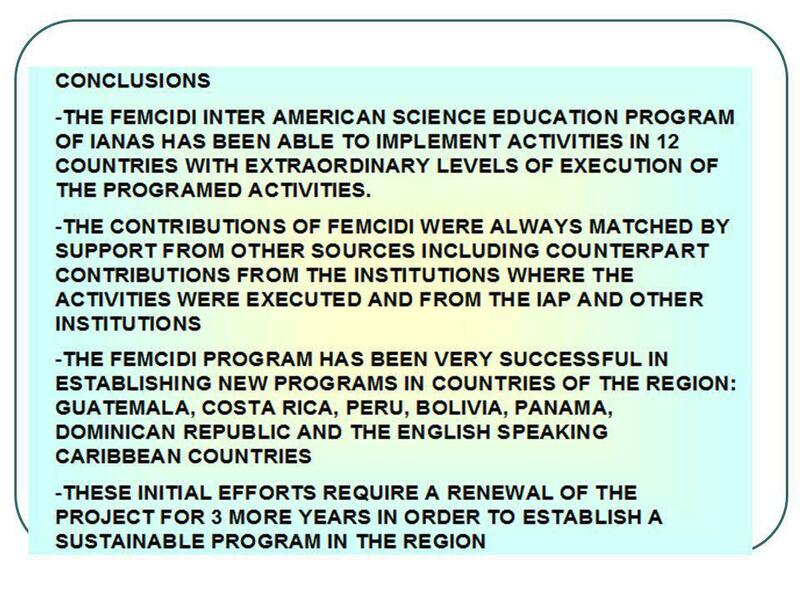 19 We hope the impulse that the program has given to each country national program will be enough for each one of them to survive, at least for some time without FEMCIDI support. 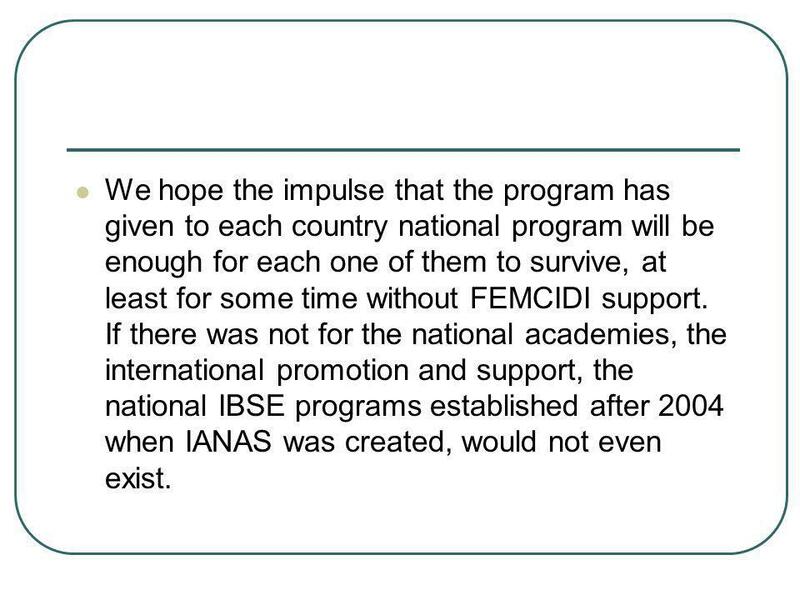 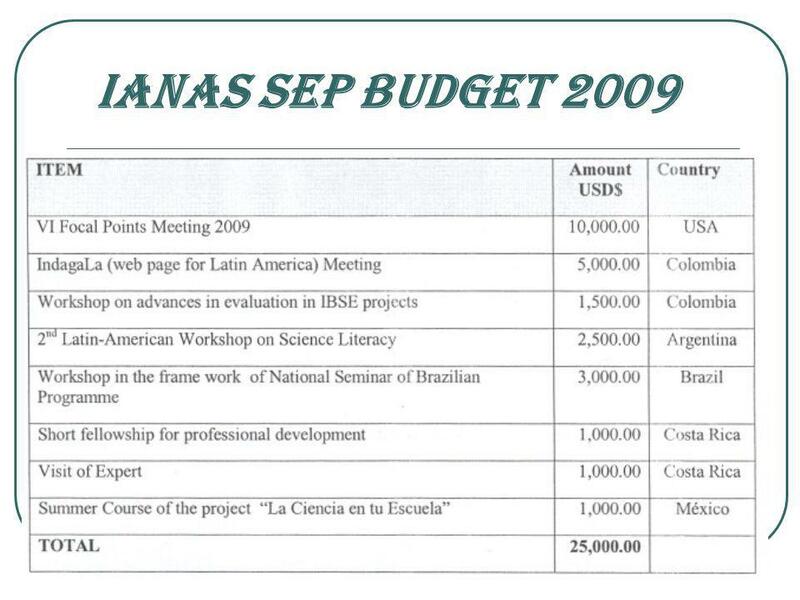 If there was not for the national academies, the international promotion and support, the national IBSE programs established after 2004 when IANAS was created, would not even exist. 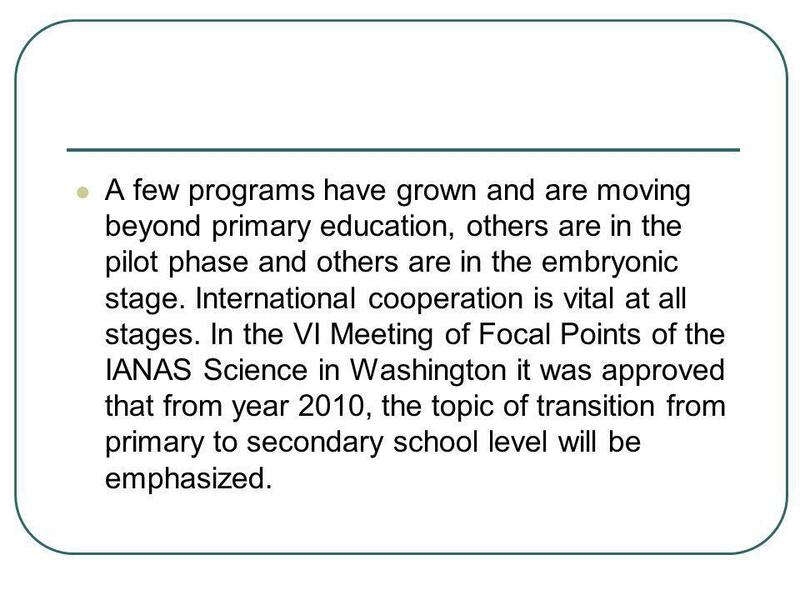 21 A few programs have grown and are moving beyond primary education, others are in the pilot phase and others are in the embryonic stage. 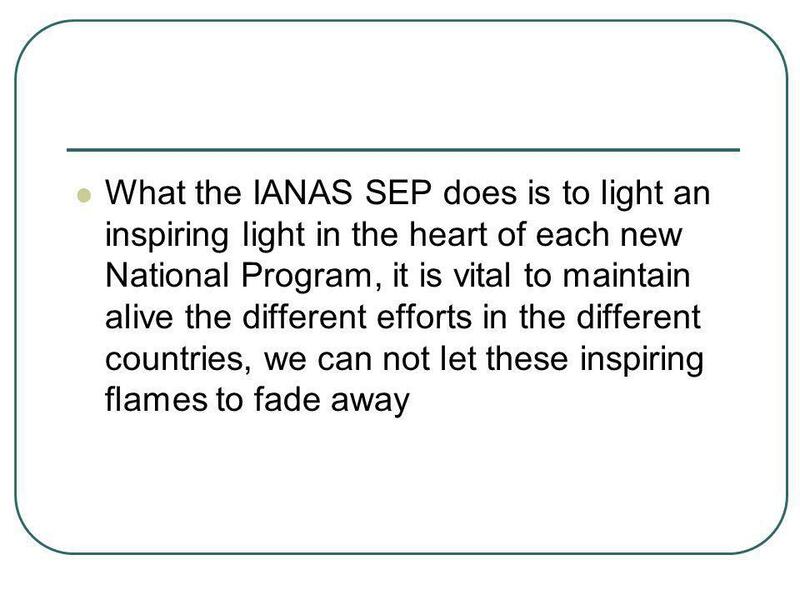 International cooperation is vital at all stages. 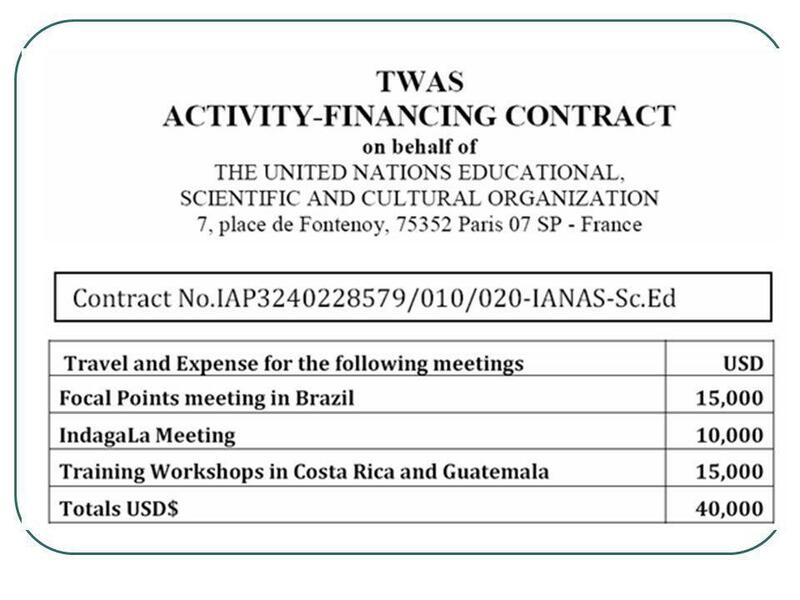 In the VI Meeting of Focal Points of the IANAS Science in Washington it was approved that from year 2010, the topic of transition from primary to secondary school level will be emphasized. 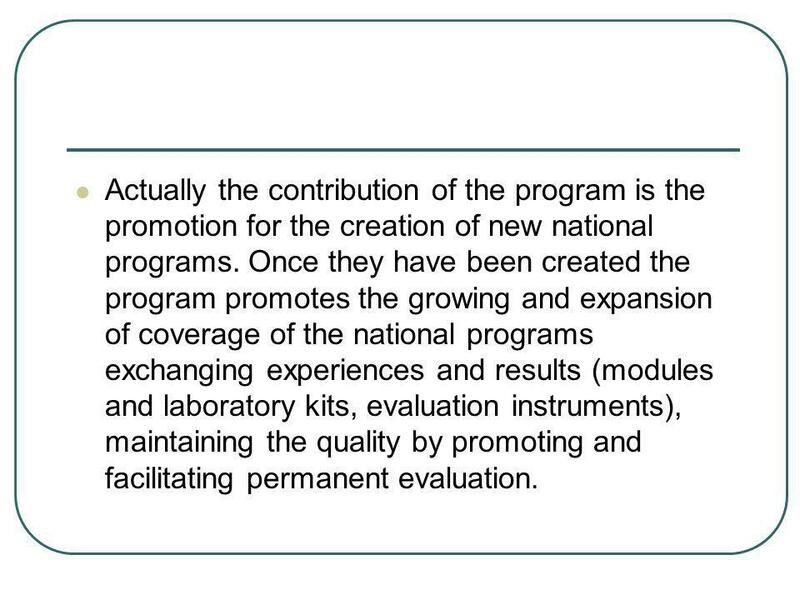 22 Actually the contribution of the program is the promotion for the creation of new national programs. 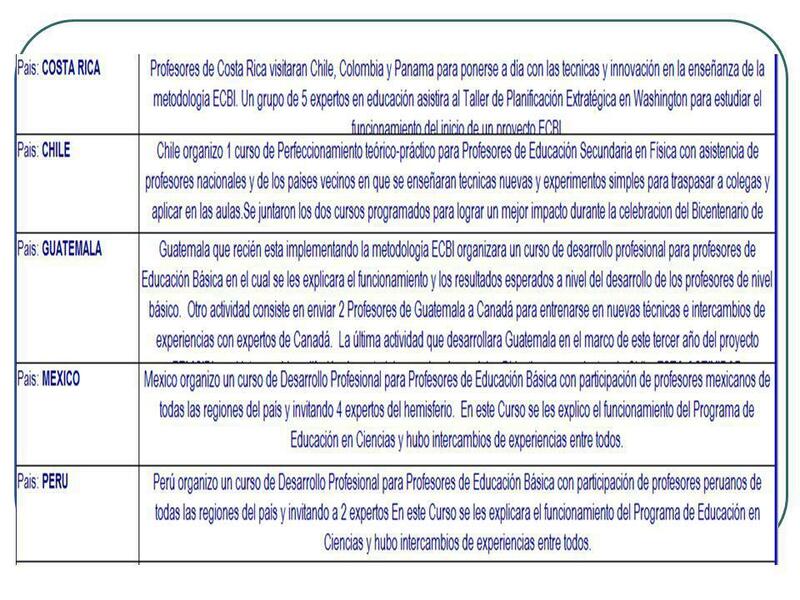 Once they have been created the program promotes the growing and expansion of coverage of the national programs exchanging experiences and results (modules and laboratory kits, evaluation instruments), maintaining the quality by promoting and facilitating permanent evaluation. 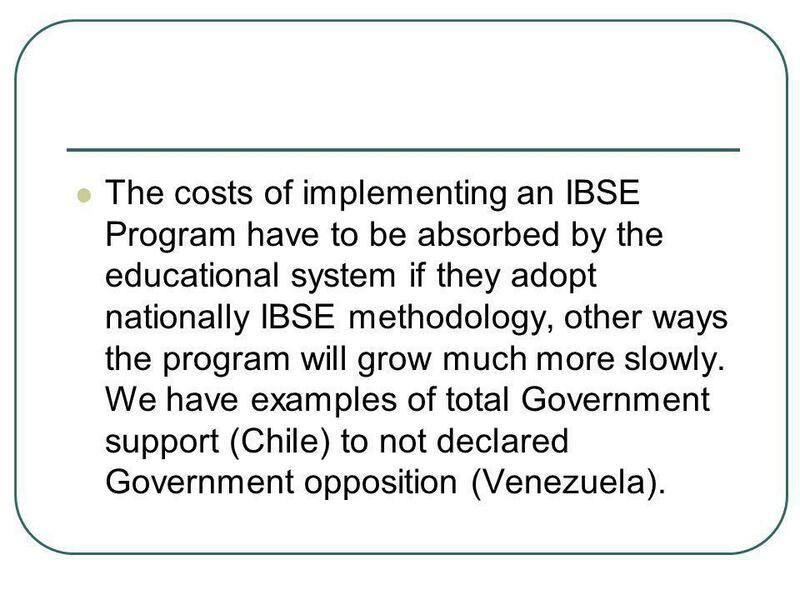 23 The costs of implementing an IBSE Program have to be absorbed by the educational system if they adopt nationally IBSE methodology, other ways the program will grow much more slowly. 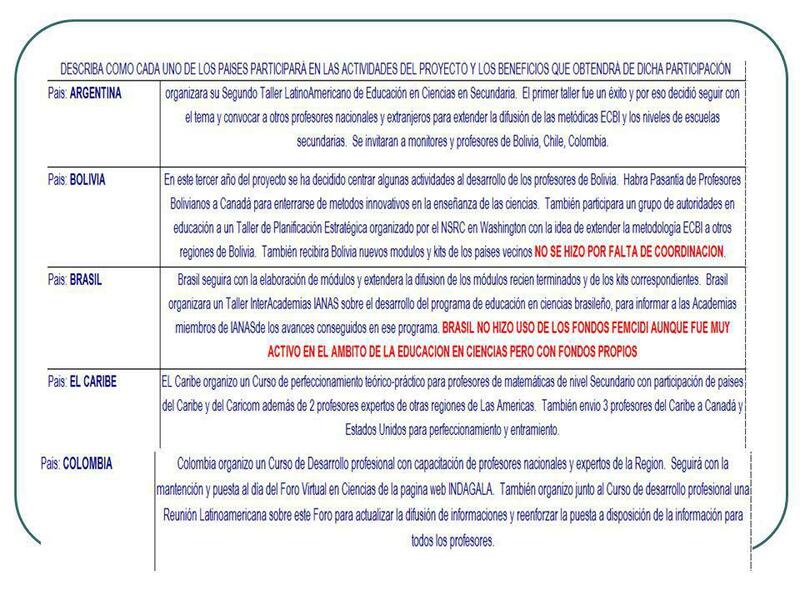 We have examples of total Government support (Chile) to not declared Government opposition (Venezuela). 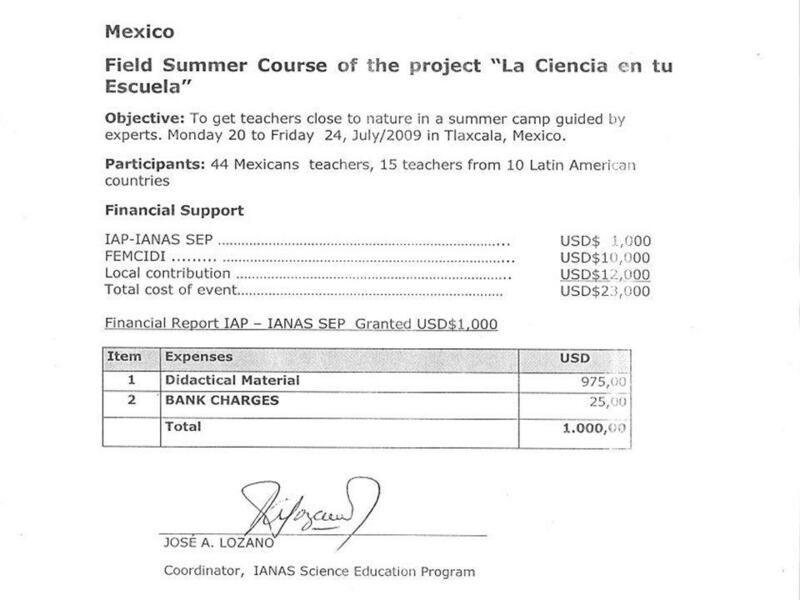 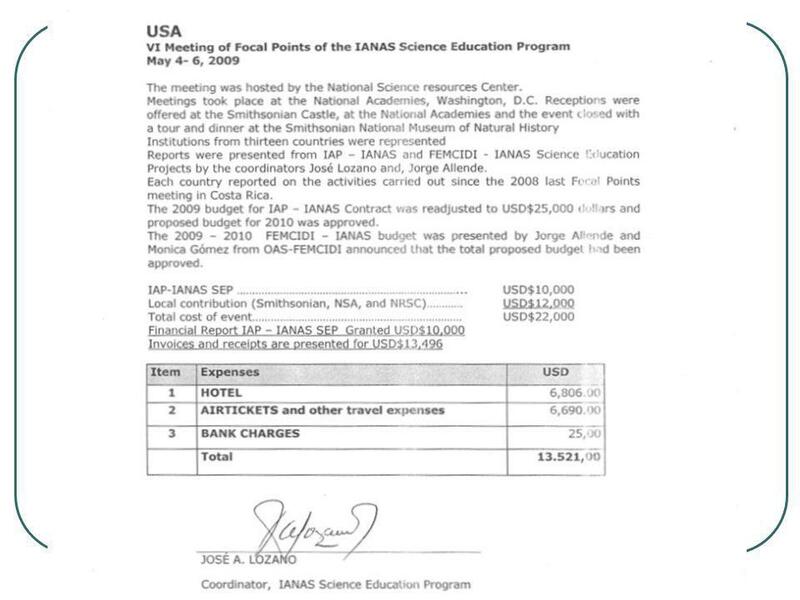 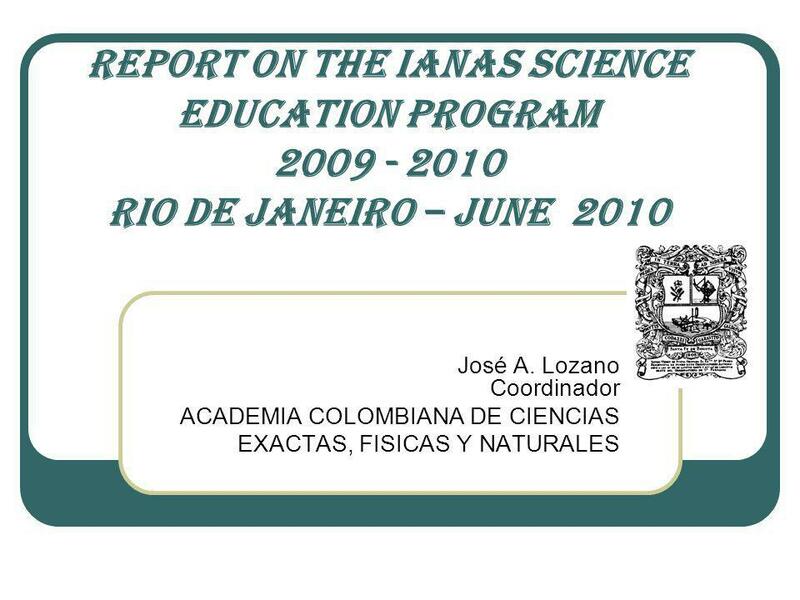 24 The Inter American Science Education Program of IANAS has been able to implement activities in 12 countries with extraordinary levels of execution of the Programmed Activities. 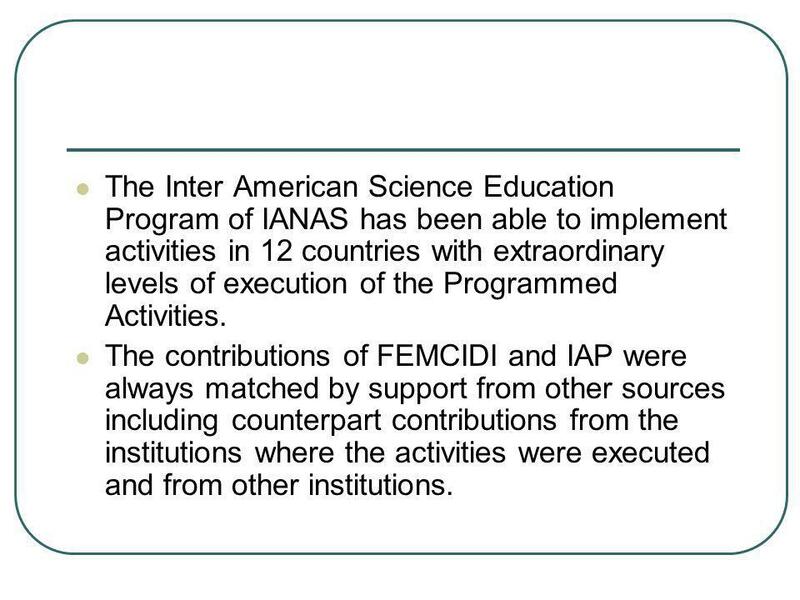 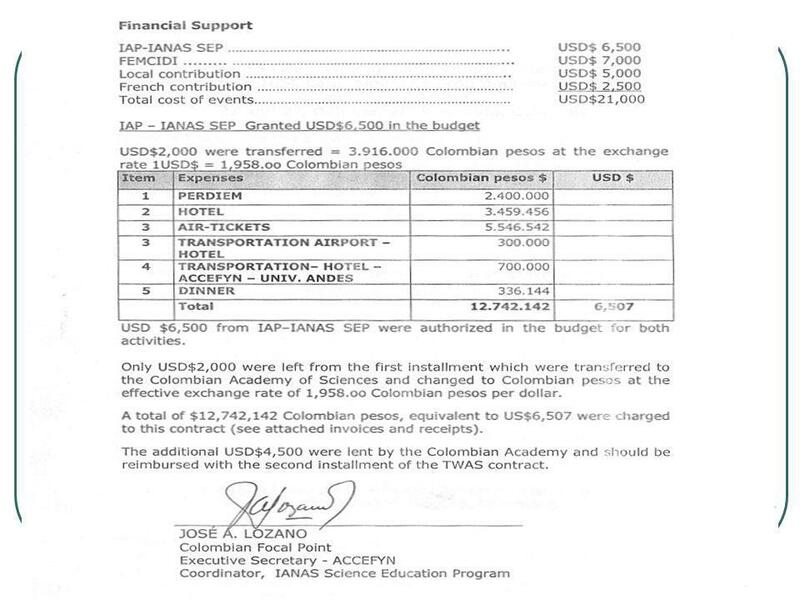 The contributions of FEMCIDI and IAP were always matched by support from other sources including counterpart contributions from the institutions where the activities were executed and from other institutions. 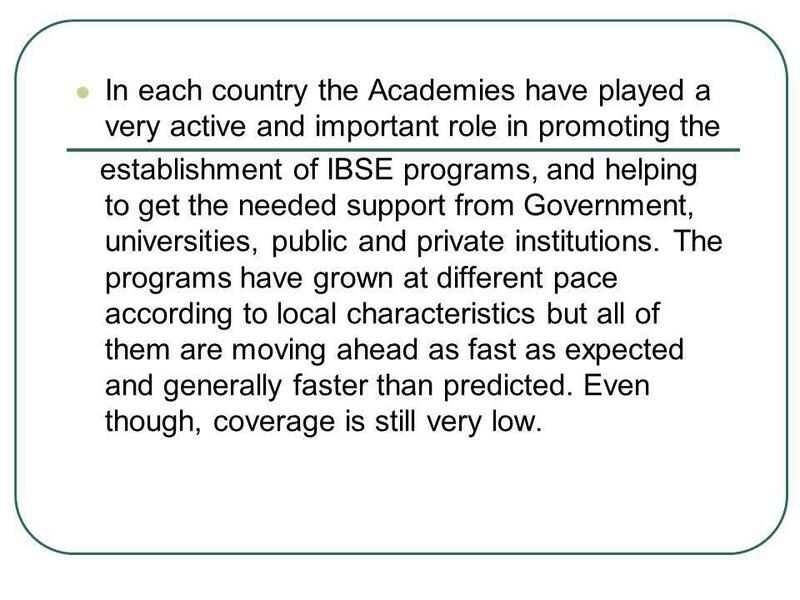 establishment of IBSE programs, and helping to get the needed support from Government, universities, public and private institutions. 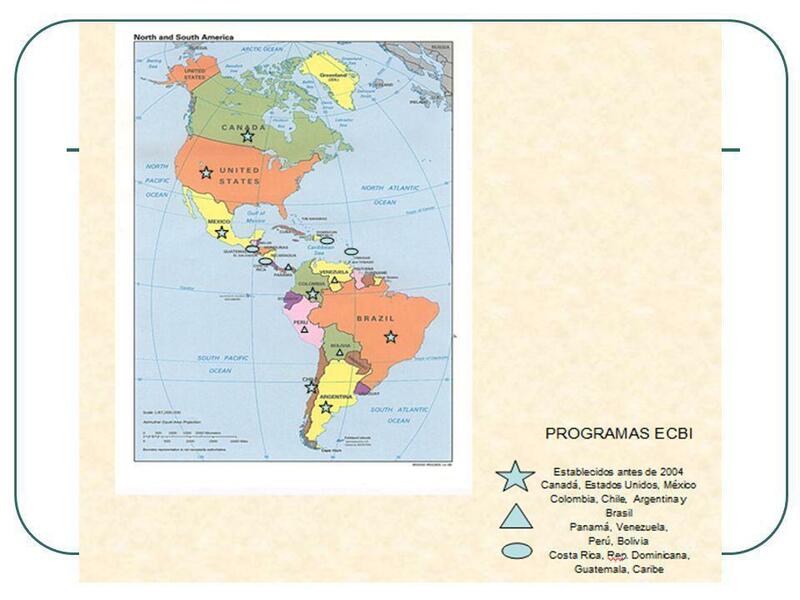 The programs have grown at different pace according to local characteristics but all of them are moving ahead as fast as expected and generally faster than predicted. 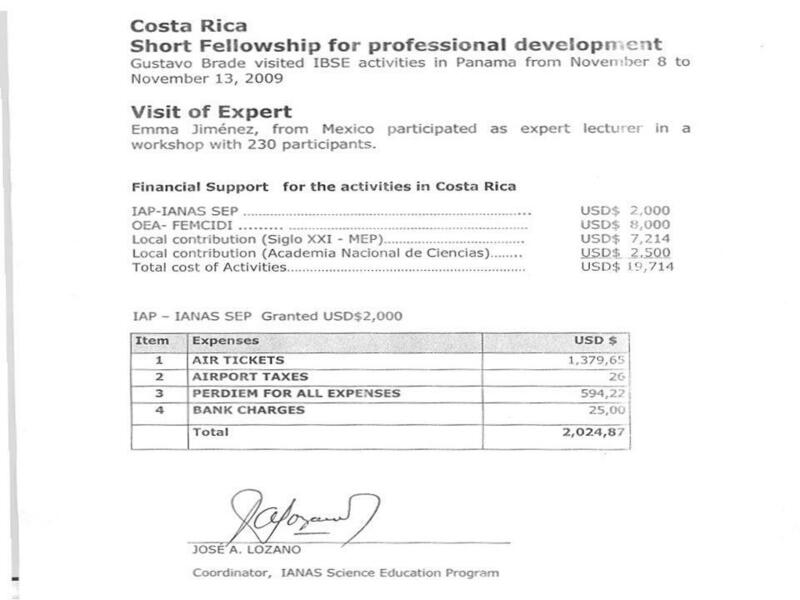 Even though, coverage is still very low. 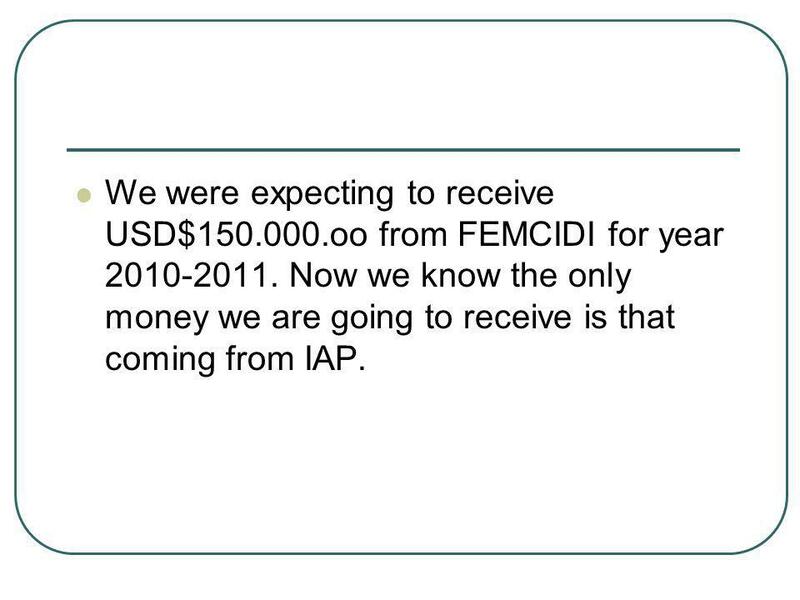 We were expecting to receive USD$ oo from FEMCIDI for year Now we know the only money we are going to receive is that coming from IAP. 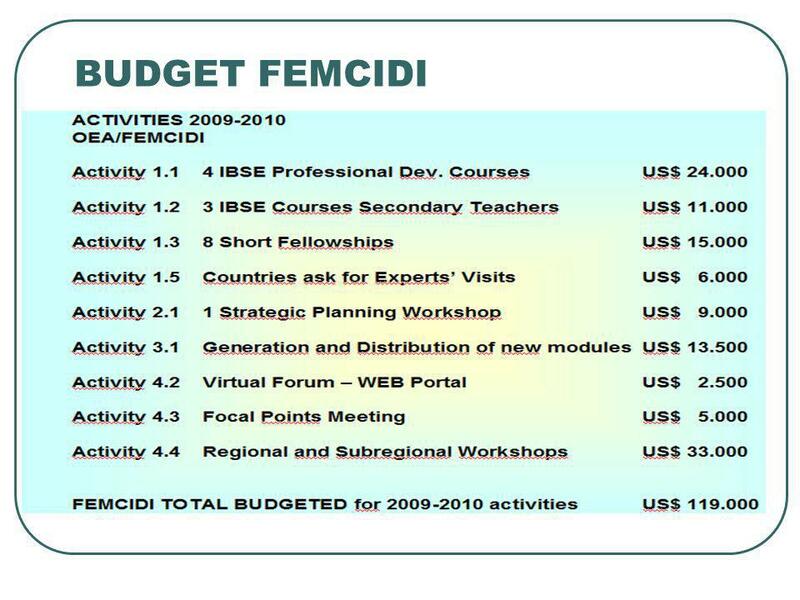 27 We agreed that the Focal Points and the Indagala meetings were the most important ones and they became even more important since we lost FEMCIDI support. 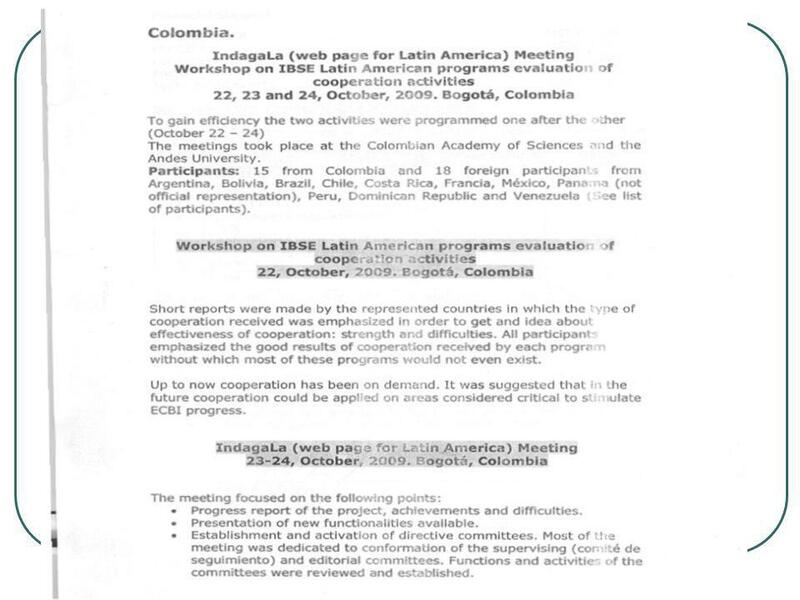 They became crucial to the program so we can plan strategies to continue working together and advance in each country with the help of the others relying much more on Indagala and communication through Internet. 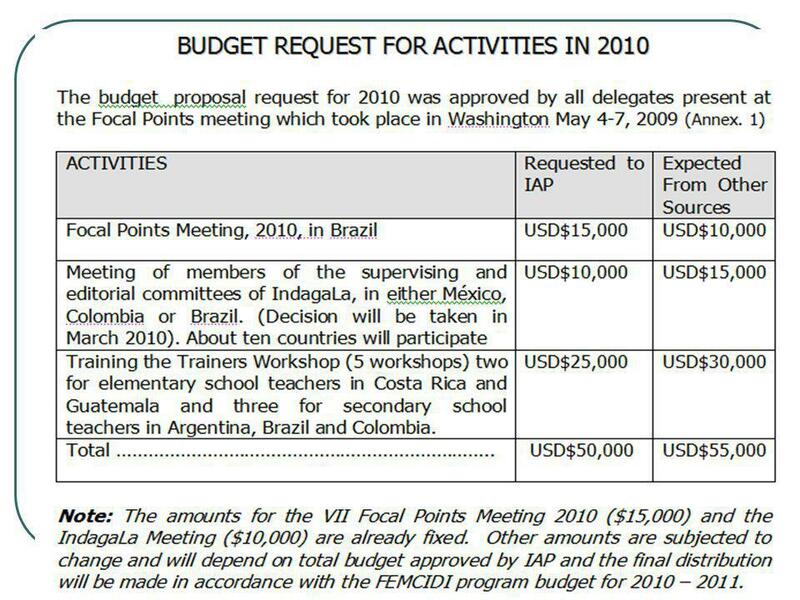 28 When the budget proposal was approved we expected to finance most activities with FEMCIDI´s money ($150,000 a year). 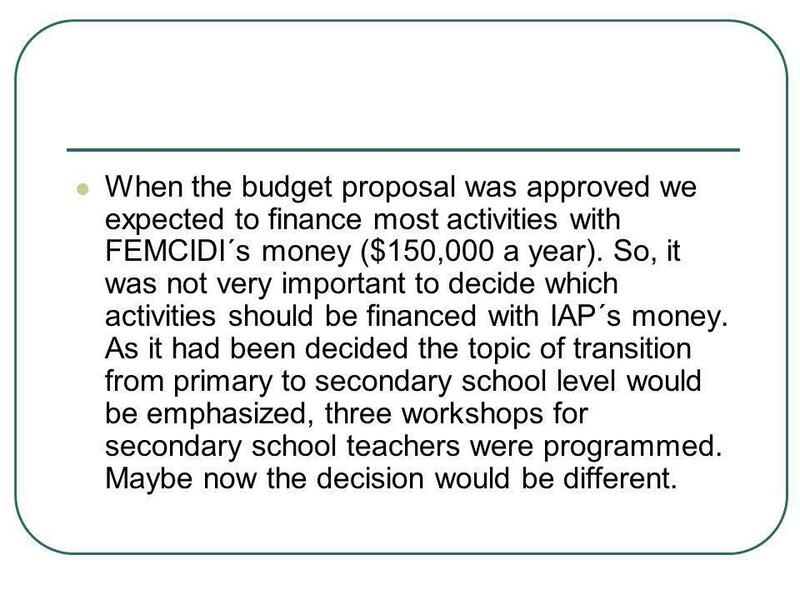 So, it was not very important to decide which activities should be financed with IAP´s money. 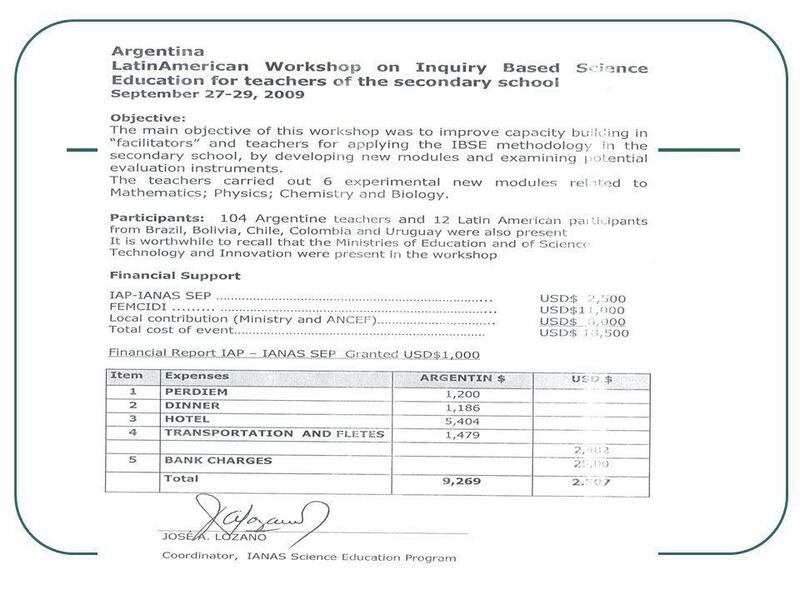 As it had been decided the topic of transition from primary to secondary school level would be emphasized, three workshops for secondary school teachers were programmed. 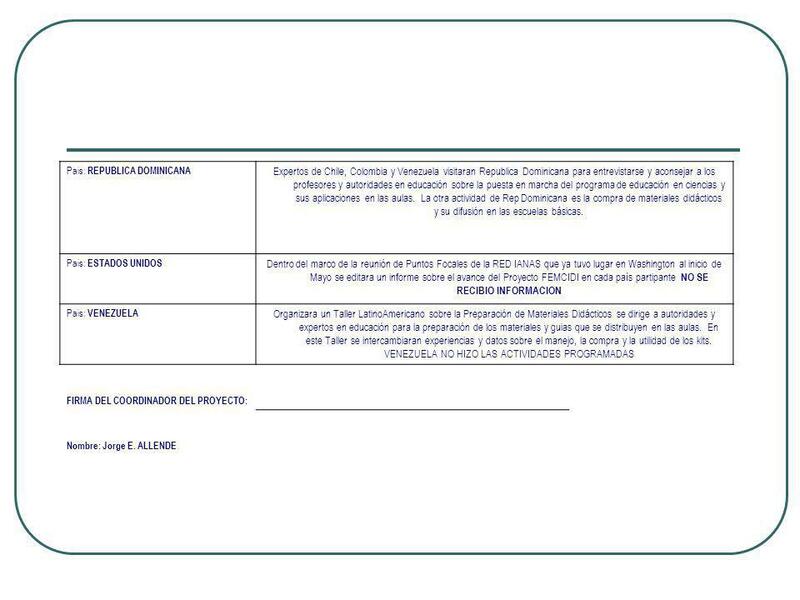 Maybe now the decision would be different. 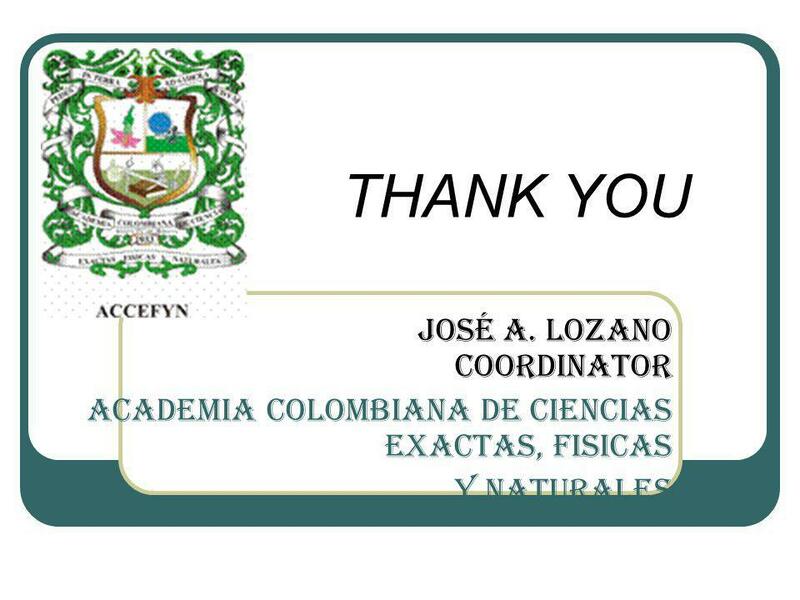 Descargar ppt "José A. Lozano Coordinador ACADEMIA COLOMBIANA DE CIENCIAS"